Pour the chicken stock into a large saucepan and bring to a boil over medium heat. Stir in the orzo and cook for 9 minutes (or until al dente). Reserve 1/3 cup of the stock and discard the rest. Meanwhile, heat the olive oil over medium heat in a 10-inch skillet. Add the shallots and garlic and cook for 2 minutes, stirring occasionally. Stir the mushrooms into the skillet and season with salt and pepper. Cook for 1 minute. Pour the white wine into the skillet and stir to combine. Cover and cook for 3 minutes. Stir the reserved chicken stock into the skillet. Boil uncovered for 7-10 minutes until most of the liquid is evaporated. 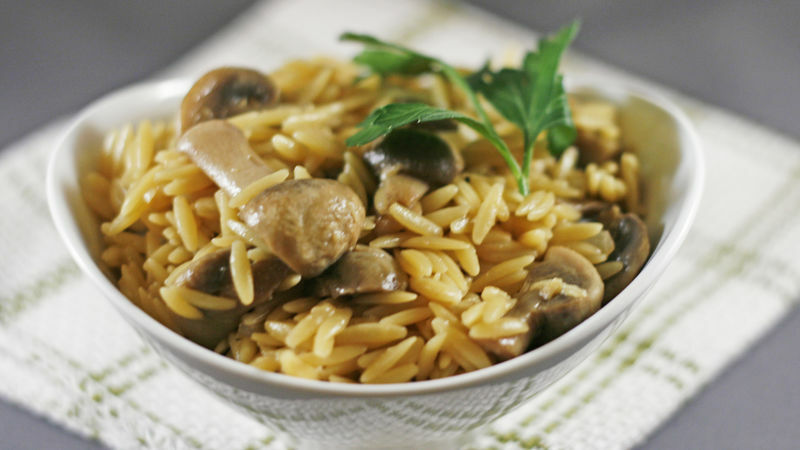 Stir the mushroom mixture into the orzo. Add the provolone a little at a time, stirring well after each addition. Season with salt and pepper, to taste. Mushrooms infused with the flavors of white wine, garlic and shallots. Orzo simmered in chicken stock. It’s a marriage made in heaven. It has flavors like risotto without the labor-intensive cooking process. Making risotto is a really specific process. You slowly cook Arborio rice, adding small additions of liquid (usually stock) until it’s fully cooked. There is a lot of stirring and hands-on attention necessary to make a perfect batch. And the reward for all your attention is a lovely, complex, creamy rice dish that wows everyone. But sometimes you want that flavor without the whole process. This Risotto-Style Mushroom Orzo is my solution. Orzo, which is a small cut of pasta, is cooked in stock (or chicken broth), infusing it with fabulous, rich, chicken-y flavor. Then, mushrooms that have been cooked with shallots, garlic, white wine and a bit of the pasta stock or broth (see pan below) is mixed in. It’s finished with sharp provolone cheese. While this isn’t creamy like risotto, it does share that complex flavoring that makes risotto so special. And it can be made in 25 minutes or less – without a lot of hands on work. Serve this as a side dish with roasted chicken and a big salad.